The footprint of the Capital Trails Coalition is DC, Montgomery County, Prince George’s County, Fairfax County, Arlington County, and the City of Alexandria. Because of the unique nature of Washington as the seat of the federal government, we also interface with numerous federal agencies that either own or control substantial portions of the region. Currently, the region already has 436 miles of existing trails; however, before the Capital Trails Network is complete, 152 projects, making up 302 miles of trails will need to be built or connected. These connections — or gaps — in the network are critical projects that need to be built to complete the network. You can find a list of those projects here. 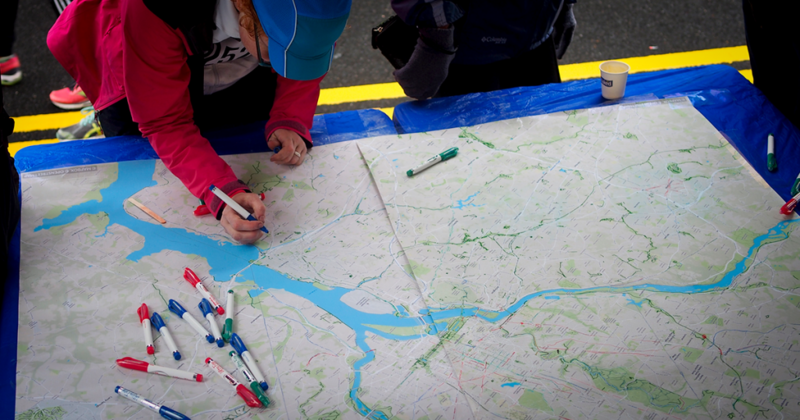 Some of the gaps in our trail network occur because the Washington, DC region is a complex place for trail planning. In many cases, a myriad of agencies have jurisdiction over a single trail corridor! That’s one reason why the Capital Trails Coalition focuses on planned trails that are interjurisdictional. Sometimes that means they span a county or city line, other times it means that a transportation project is being planned near or through park land. One example of an interjurisdictional trail projects includes the extension of the Suitland Parkway Trail. Currently, the trail ends at the DC/Maryland border, but National Park Service is studying the feasibility of extending the trail along Suitland Parkway in Prince George’s County. In order for the network to be complete, all of these projects must be completed. With such a large list of projects, the Coalition had to start somewhere, and to move forward, we needed input from our member jurisdictions. In addition to the stated priorities of the jurisdictions, the Coalition took a hard look at our own mission and values and added another layer of analysis to see exactly how trails can better serve the diverse communities in the region. We wanted to see if there were connections that may have been missed by the traditional planning and prioritization process. The Capital Trails Coalition conducted analysis on all of the project trails in the defined network using a threefold criteria, selected by the Steering Committee and refined over two months of meetings. The development of these criteria was informed by the Coalition’s vision and mission statement, as well as the Coalition’s definition of Equitable Trail Development. These trail segments are being prioritized so that the Coalition can better serve our region and connect communities with the network!